I was so happy that I was invited to the launch for the Stila A/W new Vivid & Vibrant range. I was too poorly to attend the last one, so I’m really happy I’m feeling better in myself and able to start going to more of these events. I have quite a few lined up as well so watch this space! Back to the wonderful Stila range, I was vlogging on the day of the event which you can see here. There are some clips of the products and the talk we had. It was held at Harvey Nichols at The Mailbox in Birmingham. The mailbox is gorgeous and I need to go back another time and have a good look around for sure. Throughout the month of September it is being referred to as Holly Nichols to promote women empowerment which I think is amazing! 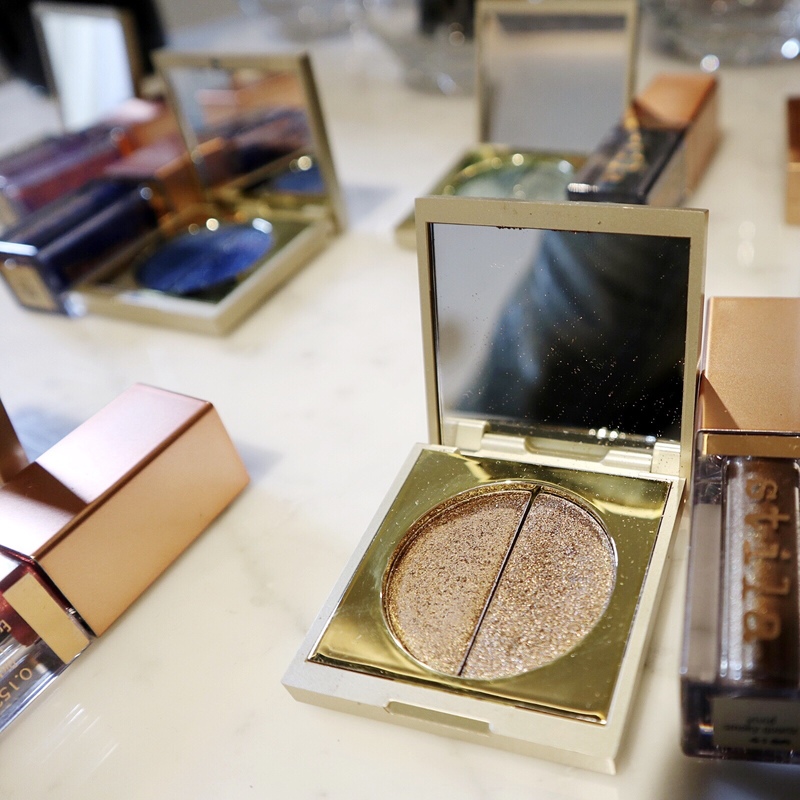 So this new range represents gemstones, which is where all of the beautiful colours come from, it is a big change for the new Stila ranges they release, a lot more daring and bold which seems to reflect the London Fashion Week from what I have seen. The colours in this range are all really vivid and metallic. I will list below the colours they have featured. I am in L O V E with this range, it’s really made me want to come out of my neutral brown, smokey eye I always go for and mix it up a bit. I have an exciting event coming up for halloween and I am 100% using my new Sapphire liquid eye shadow! Firstly, we have the amazingly pigmented Vivid & Vibrant eye shadow duo, these are so glamorous and have two sides, you have a metallic foil-finish shade which coincides with a sparkly and glittery shade. It would be perfect to use the foil finish all over the lid and cut crease then just add on the glitter to the inner lid. I cannot wait to try this out. I will share the looks with you guys when I get around to it. Next we have the wonderful Heavens hue highlighter in incandescence, I find the more pinky highlighters give a healthy glow and really suits my complexion. The highlighter is magic, you need to try it or go to the Stila counter near you and swatch it, you will just fall in love. It lasts so well too, I pretty much didn’t need to reapply all day it is certainly worth the money and the same for the eyeshadows, as they are so pigmented, a little goes a long way. We then have my absoloute favourite the liquid eye shadow, it’s long-wearing and feels so weightless. When I first thought about liquid eye shadow I thought it would be really sticky and feel heavy but it really doesn’t. It dries so quickly and feels nice and weightless. It’s so quick and easy to apply so you can still look bold, fabulous and not have to spend ages doing your make up. They also brought out some gorgeous liquid eyeliners and smudge stick eye liners which are in the gemstone colours except garnet. They give you that beautiful classic cat flick with a bit of colour. You could also use the smudge stick and blend it out a bit to give a bit more of an edgy look. Have you tried the new range? What do you think? Let me know in the comments below! Oh wow! Looks stunning! Love the colour range!